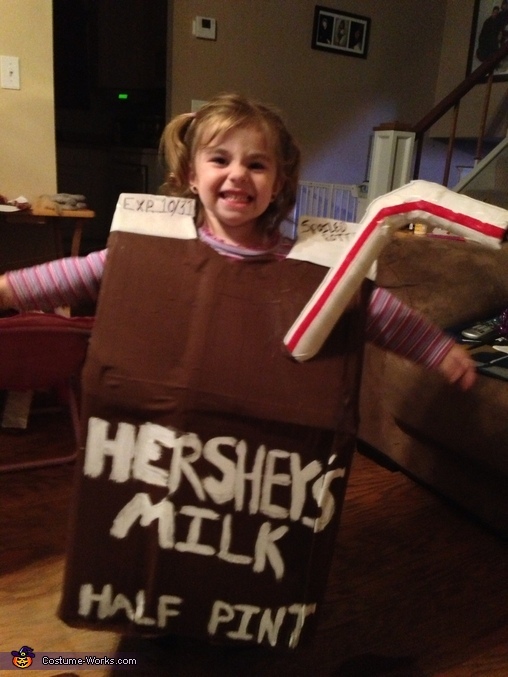 This is my beautiful daughter in her chocolate milk costume. I asked what she would like to be for Halloween and she exclaimed- Chocolate milk!!! My husband and I took a box and duct taped the sides up, covered with brown fabric, and painted the words on. I love this costume, because the lil girly is so sweet & happy!! Mom and Dad, made it themselves (not ordered online or bought), really put their heart into it for their lil girl. I live the costume because it is creative, original and cute. And who doesn't live chocolate milk! And...my adorable grand-niece is wearing it and obviously loving it. Great job! What is the straw made from and how did you get it to stay?